This will be a small tribute to a wonderful spice and plant, called turmeric, or curcumin. Not only is it "nature's own antibiotic" but it has also been proven to help fight melanoma and breast cancer. As many of you probably know, antibiotics are very effective, but not all that healthy. 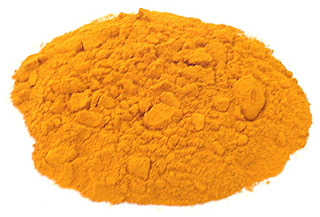 So as I just got off a cure of antibiotics, I've decided to continue healing myself with turmeric. I have 1 teaspoon of it with warm water once a day. Not only does it do all this, it also helps with a variety of digestive disorders, and raw turmeric (the root, which you apparently use much as you would ginger) strengthens cartilage and bone structure. So far, I haven't come across any negative information on this wonderful plant! It is also used in a lot of cosmetic procedures, but I won't get into those. I can just say that apparently it is supposed to be an anti-aging agent.